Suburban Propane's top line is falling, but don't run for the hills. It's not as bad as it looks. Image source: Subruban Propane Partners. Suburban Propane Partners LP (NYSE: SPH) sports a huge 12% or so distribution yield. 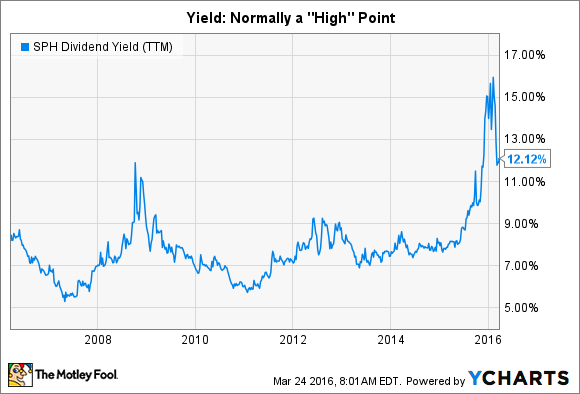 Yields at that level are often a sign that investors think a company is a risky investment. Add in the fact that Suburban's top line has fallen year over year in each of the past six quarters, and you can understand why investors might be worried. But don't freak out -- that's the worst mistake you could make right now. When it comes to fuel, propane is mostly an afterthought. You probably think of a backyard cookout when you hear the word "propane." And while that's appropriate, the fuel is also used to power small vehicles in warehouses, dry crops, and heat homes in hard-to-reach locations. Low cost and portability are key selling points. Recently, propane prices have been low. That's a good thing because cheap propane acts as a deterrent to customer switching, a longer-term problem for the industry I'll discuss in a second. But because propane is what Suburban sells, low prices have had a negative impact on the top line in a big way. For example, revenues declined 27% in 2015! However, Suburban is really just a middle man. It gets paid to deliver propane, basically passing propane costs through to its customers. So the top-line decline isn't as big a deal as it may at first seem. Proving this out is that fact that EBITDA in 2015 declined only 6% or so, much less than revenues. Another interesting aspect of the propane industry is growth. I noted that propane is being displaced (honest, I'll talk about that soon), which suggests that Suburban and its peers should be shrinking. But they aren't and acquisitions are the reason why. For example, Ferrellgas Partners (NYSE: FGP) has consummated over 200 deals since 1986. For its part, Suburban basically doubled its size when it bought Inergy's propane business in 2012, catapulting it into the top echelon of the propane industry. Although there's always risk involved in mergers, these companies are pros at buying both large and small competitors. And that provides an avenue for growth that you might miss if you don't understand the propane industry. Perhaps the biggest long-term issue facing propane is displacement (See, I'm a man of my word). Propane is most useful because it can be easily transported. But technology advances are offering alternatives, like fuel cell-powered lifts that can replace propane in warehouses. And natural gas pipeline expansions and electric heating are providing competitive options for keeping homes toasty. So the long-term trend for propane in the United States has been, and will likely continue to be, slow decline. That's why acquisitions are so important, they not only provide growth, but they help to offset volume declines from customer switching. But you'll still want to keep an eye on attrition if you intend to own a propane company. The bigger issue over short periods of time for Suburban and its competitors, however, is the weather. The past couple of winters have been warm ones, and that's reduced volumes sold. So unlike oil companies, where price is the key problem, weather is the bigger issue to watch in propane. Although weather is out of the partnership's control, and a few warm winters aren't the end of the world. In fact, Suburban has been doing the right things to deal with the issue, such as cutting costs. In its fiscal first quarter, the company trimmed expenses by roughly 5%. Suburban has also been working hard to keep its finances strong, that's important if you're top and bottom lines are weak. For example, it acquired a propane business in the quarter without having to tap its bank lines, running the partnership and growing it with cash on hand. It still has nearly $60 million of cash in the bank and roughly $250 million worth of capacity on its bank lines to keep growing its business. But, in an acquisition driven business, you'll want to watch the balance sheet closely, just in case. It isn't a problem now, however that doesn't mean it can't turn into one. That said, if Suburban is feeling the pinch of warm weather, then smaller peers are probably hurting just as bad, if not worse. That means the opportunity for more acquisitions. And solid finances suggest that Suburban is in a good position to take advantage of the situation. Even the tough environment could turn into a net benefit, so long as Suburban doesn't get greedy and try to do too much deal making at one time. So the worst thing Suburban Propane Partners unitholders could do right now is get overly concerned about falling commodity prices. Cheap propane is actually good for the partnership even though it hampers the top line. The next big mistake would be to get overly concerned about the weather -- that's hurting volumes, but it also provides more opportunity for financially solid Suburban to acquire the businesses it needs to keep growing. There are clearly risks here, but the right thing to do is to understand them and put them into the proper context. At the moment, the bad news isn't as bad as it might seem.